Nebraska made short work of Iowa State on Sunday afternoon but the fans stuck around after the match to welcome back one of their own and honor her for her legendary Husker career. 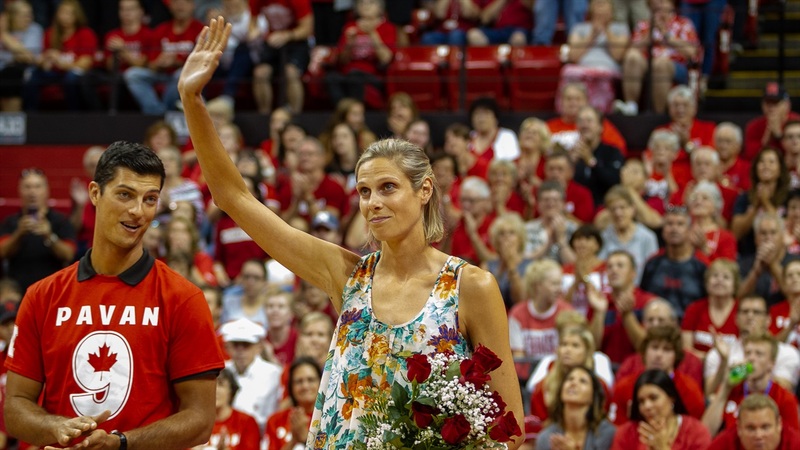 After entering the Nebraska Athletics Hall of Fame on Friday, Sarah Pavan saw her jersey raised to the rafters at the Devaney Center, joining seven other Nebraska volleyball greats. This weekend was Pavan’s first chance to experience a match at the Devaney Center as the Huskers were still competing in the NU Coliseum during her career from 2004 to 2007. After the match, Nebraska unveiled Pavan’s No. 9 jersey alongside the other Nebraska greats above section C4. Cook addressed the crowd before turning the microphone over to Pavan. Former Husker Sarah Pavan addresses the crowd at the Devaney Center during her jersey retirement ceremony. 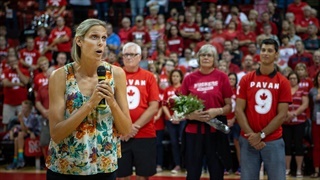 Karen Dahlgren, Lori Endicott, Janet Kruse, Cathy Noth, Allison Weston, Stephanie Thater, Nancy Metcalf, Jordan Larson and now Sarah Pavan have all had their jerseys retired by the school. Pavan had plenty of praise for the Devaney Center crowd, listed at 8,108 for Sunday’s match. Pavan made sure to thank Cook for everything he’s done for her. Next, Pavan turned her attention to the fans. When the applause finally died down, Pavan had one final message for the fans before leaving the floor. Thank you for being the greatest fans in all of college volleyball and the entire world, in my opinion. Cook said Pavan’s address went as he expected and that he was happy Nebraska could finally make the experience happen after about three years of trying to work it into her schedule. Pavan, a four-time All-American who holds three school records and a list of accolades that runs a mile long, has certainly left an incredible legacy at Nebraska. Sweet was spectacular against Iowa State, finishing with a match-high 11 kills and not hitting errors. Cook even said she showed some Pavan-esque qualities in the match. A lot of what Cook does know in terms of team motivation and the mindset he tries to instill in his program came as a direct result of his time coaching Pavan, who he said was one of the most competitive players he’s ever been around. 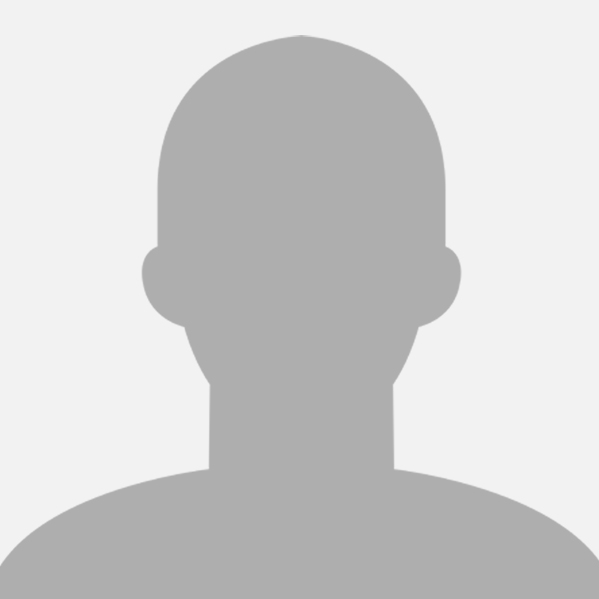 Nice article, but I caught a mistake in your story. After entering the Nebraska Athletics Hall of Fame on Friday, Sarah Pavan saw her jersey raised to the rafters at the Devaney Center, joining seven other Nebraska volleyball greats. It should read: "joining eight other Nebraska volleyball greats." Sarah is the ninth player to have her jersey retired. Fittingly she wore #9 when she played here. Coach Cook had been wanting to retire her jersey since at least 2014 but due to her professional volleyball commitment among other things, she couldn't find the time to make it back to Nebraska. Glad she finally made it back. She's worthy of both honors bestowed upon her this past weekend.